Condition: Main room still standing. 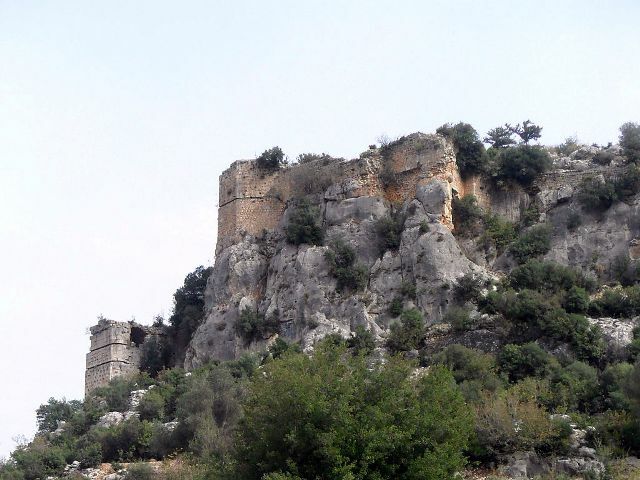 Notes: Dagli Castle (Turkish: Dagli Kalesi) is a castle ruin in Mersin Province, TurkeyThe castle was built during the Roman Empire. But it was used during the Byzantine Empire and the Armenian Kingdom of Cilicia. It probably controlled ancient and medieval caravan routes.The castle is on a hill overlooking Karakiz valley. Most of the buildings as well as the walls are in ruins. But a big room, known as the queen�s room, survives. There are also two small compartments which are thought to be toilet and some dark quarters which may be dungeons. Next to the main gate there is a rock relief showing two soldiers and one pregnant woman. There is also a highly effaced inscription. Although it was thought to be in Armenian, up to now only a few words could be deciphered. According to Professor Bogos Levon Zekiyan, only four words are readable; to son, Armenians, king and date.